Fort Rinella in Kalkara holds an interesting festival. Why so interesting? Because it is accompanied by military forces parades! Are you fond of 19th century battlefield skills and warfare? Then you must take a closer look at this very event. There will be much to see – horseback troops, infantry, artillery and more. Fort Rinella under restoration for many years.It has started already in 1980s. However now we can see that it was really worth it. We can look forward to marvelous scenes of warfare. Cavalry charge and skills at arms of the time already past is not something usually seen every day. This long expected show starts at 2.pm and it will last every day 2 hours, till Sunday. And the whole thing is going to and with the big bang. 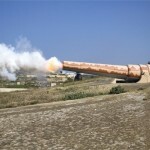 On Sunday we can witness 100-ton gun firing at 4 p.m. Enjoy if you will participate.